The Tasmanian Fortune Teller, and Dream Book. Advertised once only in True Colonist 18 Feb. 1835 price 1 s. Listed as ‘The Dream Book’ in Hobart Town Almanack 1835 as one of the publications from Mr. Bent’s Press during the year. House of Assembly, Van Diemen’s Land: Public Meeting of the Colonists, Saturday, August 2, 1834. A. Bent, printer. J. D. Campbell, reporter. 22 p., 28.5 x 22 cm. Printed in 3 columns. Colophon: Hobart Town, Van Diemen’s Land: Printed by Andrew Bent. Report of the meeting reprinted from the first two issues of the True Colonist (5 and 12 Aug. 1834) followed by other articles (mostly ‘Hints for Mr. Hume’) which appeared between 2 and 16 Sep. Announced as forthcoming on 2 Sep. 1834, but not actually published until towards the end of Jan. 1835, when it was for sale at 2s. 6d. per copy. Greenwood again! Dreadful Torture at Van Diemen’s Land. Broadside ca. 3 Apr. 1835. Submitted to the Colonial Secretary on 3 Apr. 1835 by Chief Police Magistrate Forster. The broadside, inflammatory in the extreme, reprinted a letter signed ‘a Subscriber in the Southern Hemisphere’ which had been published in the Sunday Herald in London, together with that paper’s horrified commentary, and some additional remarks added by ‘Ed. Col.’ It had been distributed about the town and Forster believed it was printed in Bent’s Office, although no proof could be obtained. Forster transmitted it as an additional reason why, as he had already suggested, convict printers should not be assigned to those who disseminated the vilest sedition and abuse of the government. Considered in Executive Council 4 May 1835, but Arthur wanted to determine the number and police characters of the convict printers, pressmen, and compositors in assigned service before making a decision. Arthur believed, probably correctly, that the original letter, giving a wildly exaggerated account of Greenwood’s flogging and subsequent hanging in 1834, had been written by Gilbert Robertson. Robertson, proprietor and editor of the True Colonist, went to gaol for libel shortly before this broadside was printed and his paper was being printed at Bent’s office. While Robertson was obviously responsible for the content of this print, Bent may well have had a hand in its production and it was printed with his equipment. 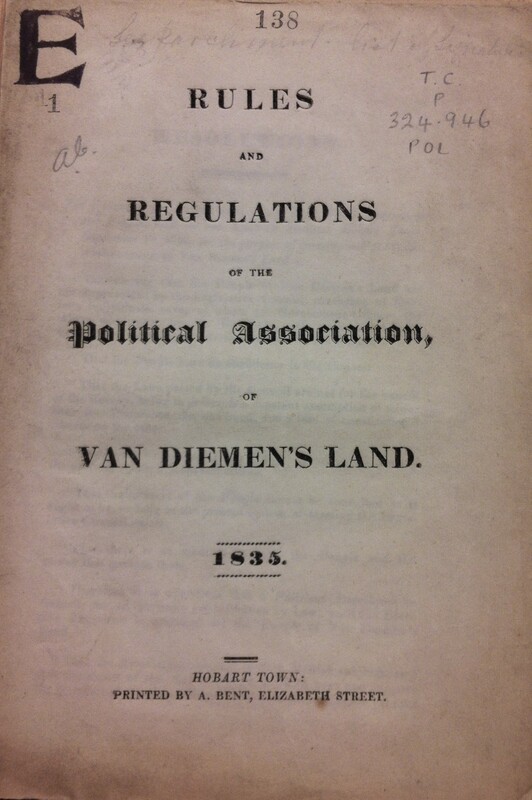 Rules and Regulations of the Political Association of Van Diemen’s Land. 1835. Hobart Town: Printed by A. Bent, Elizabeth Street. 8 p., tp. 20.5 x 14 cm; sheet 41 x 27 cm. 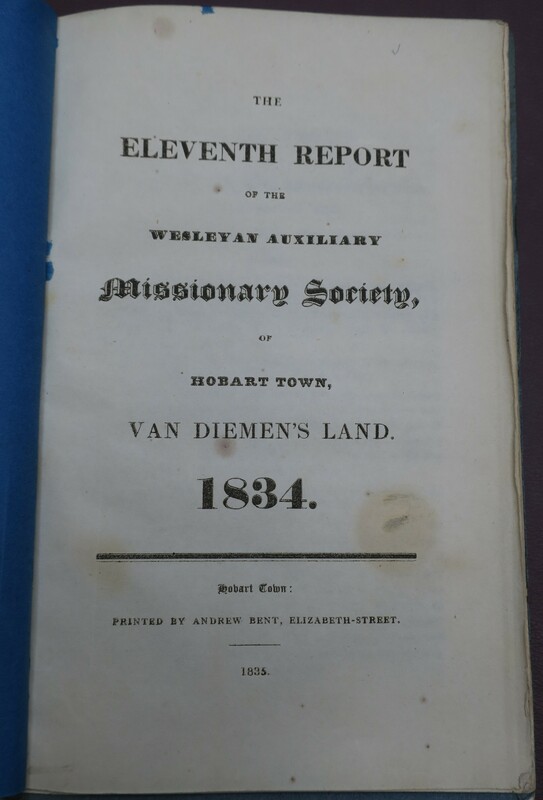 The eleventh Report of the Wesleyan Auxiliary Missionary Society, of Hobart Town, Van Diemen’s Land. 1834. Hobart Town: Printed by Andrew Bent, Elizabeth-street. 1835. 22 p., 21 x 13 cm.Bright blue paper wrappers. 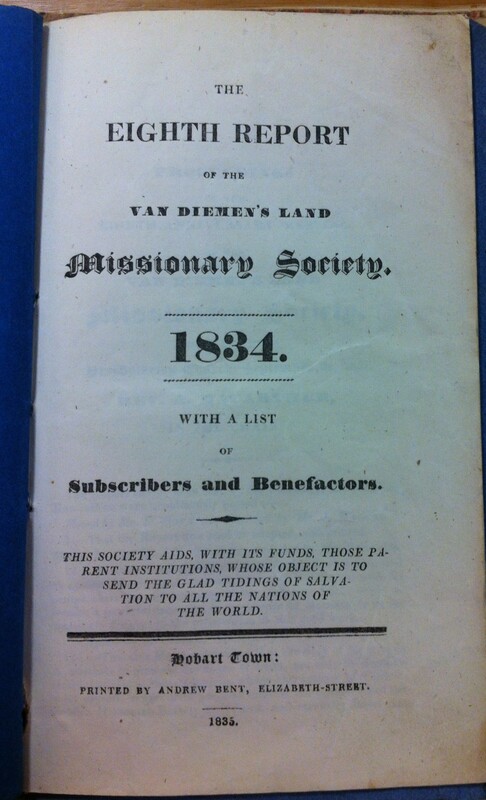 The eighth Report of the Van Diemen’s Land Missionary Society. 1834. With a List of Subscribers and Benefactors. Hobart Town: Printed by Andrew Bent, Elizabeth-street. 1835. 14 p., 8vo. Bright blue paper wrappers. Possibly printed by Bent although Henry Melville is also possible. Broadside, 40 x 16 cm. approx. Text printed in one long column on right hand side of the sheet. The petition, probably drawn up by Thomas Gregson, was discussed at a public meeting at the Ship Inn on 1 Sep. 1835. This was held to express indignation at the flogging of a free British sailor, Thomas Berry, for an allegedly trifling offence. The petition complained of the secrecy of the Legislative Council (which was unrepresentative and passed unconstitutional laws), and of the misapplication of Crown patronage in appointments to the magistracy. It concluded by asking that the free population of VDL might be governed by British Acts of Parliament until they could obtain a legislature of their own election. There was considerable delay in getting the petition to England (at least officially) but this copy must have been printed off immediately and forwarded to England by the Laing. It was sent in to Secretary of State Glenelg by George Lewis (brother to Thomas Lewis) on 24 March 1836. The text of the petition was printed with the report of the meeting in both the TC 4 Sep. and CT of 8 Sep. 1835.